The Iowa Barnstormers find themselves in a 0-2 hole after being defeated by the Milwaukee Iron. The Barnstormers saw themselves in a 13-0 hole early on in the first quarter and were just not able to dig out of that hole once again. The Barnstormers scored one time in the first quarter with a Vena to Blythe touchdown reception. During the first Barnstormers possession of the second quarter, special teams attempted a two point conversion pass, but a penalty was given for illegal forward pass on Khalil Carter. In the second quarter both Schmidt and Dodge had touchdown receptions. By the end of the first half, the Barnstormers were down 19-30. In the Second half of the game the Barnstormers kept working to pull themselves ahead of the Iron. Vena threw one interception in the third quarter and was able to complete passes to Blythe for his second and third touchdown receptions of the game along with rounding out the receivers with a McCown touchdown reception as well. The Barnstormers got within 10 of the Iron in the second half but were still short when time expired. The team is coming back to the Well and determined to show their home crowd that they can pull a W on the board and back into the win column. 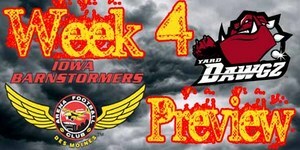 The Barnstormers are back on Wellmark Field this week as they take on the Oklahoma City Yard Dawgz. The Yard Dawgz are currently 1-1 and they are also 1-1 against the Barnstormers. On paper the stats match up pretty evenly between these two teams which should make it a very competitive game. The Yard Dawgz struggled in Week One and were defeated by the Jacksonville Sharks by a score of 54-38. They were able to easily defeat the Cleveland Gladiators 63-50 in Week Three. Quarterback Tommy Grady has been off to a good start on the year passing for 495 yards and eight touchdowns and wide receivers Timon Marshall has caught for 130 yards and three touchdowns. -This is the third meeting between the Oklahoma City Yard Dawgz and the Iowa Barnstormers, the first in the AFL. The series is currently tied at 1-1. Blythe had another stellar week and keeps proving he is a great fit for arena football. After being named the league choice Cutters Catch of the Week in Week One, Blythe exploded and has become a major target for quarterback Ryan Vena. Blythe was always acknowledged during his college career for making big plays and so far has proven that he will continue to do so while in a ‘Stormers uniform as he scored twice in the second half keeping them within 10 points of Milwaukee. The Iowa Barnstormers head back out on the road to take on the Orlando Predators on April 30 and will be broadcast live on the NFL Network! The Barnstormers then return home to Wellmark field to take on the Cleveland Gladiators at 7:05. Tickets start at just $15 a seat; call the Barnstormers Front Office TODAY: 515-633-2255!